Open today, Saturday August 12, and Sunday August 13, 9 am to 6 pm. Picking continues to be terrific in both front and back fields. 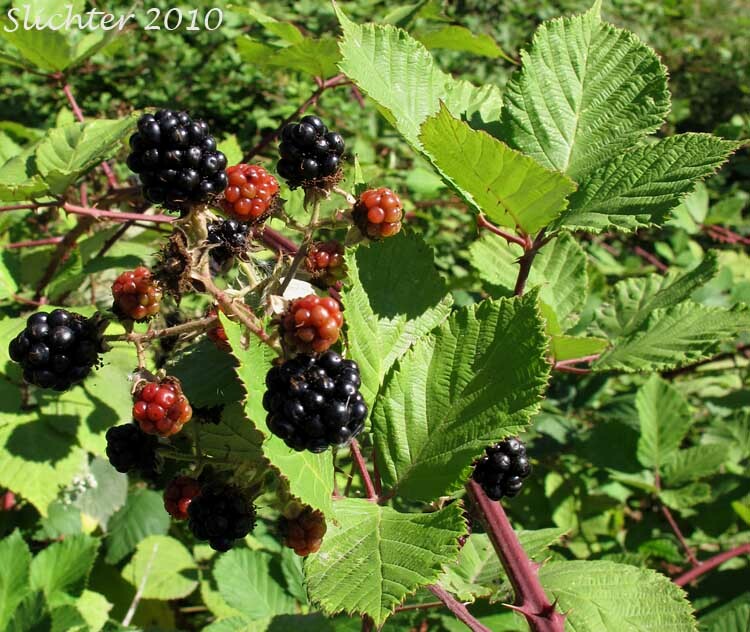 To help you enjoy your visit at the farm, we have been actively clearing the fields of Himalayan blackberries. These are the berries that grow wild in our area with nasty thorns and ymmy berries. The other weekend, I spotted a runner while taking a customer out to the backfield. The following Monday, I was determined to find that blackberry and remove it. This was during the hot weather, so I was working from 8 to noon that day. By 10:30 am, I hadn't found the runner. I was beginning to feel like Ahab hunting the Great White Whale, only my whale was green and well hidden. Meanwhile, I pruned two bushes that needed some attention. Finally, shortly before I was going to leave, I spotted it, snaking over a group of five bushes. It was "cleverly" rooted in the middle, where it was difficult to reach. I started pruning. Then that evening, I returned and continued my determined approach. Two hours later, I had gotten my great green whale. Another nasty representative removed.